THE Fife Ethylene Plant hosted a series of Burns Lunches for senior citizens last week. Lunches were held at the Mossmorran plant on Tuesday, Wednesday and Thursday afternoons for the communities of Cardenden (Tuesday), Cowdenbeath (Wednesday) and Auchtertool and Lumphinnans (Thursday). Two bus loads of of senior citizens from the Cardenden area attended a Burns Lunch at the Mossmorran. On arrival the veterans enjoyed a three course meal which was thoroughly welcomed. 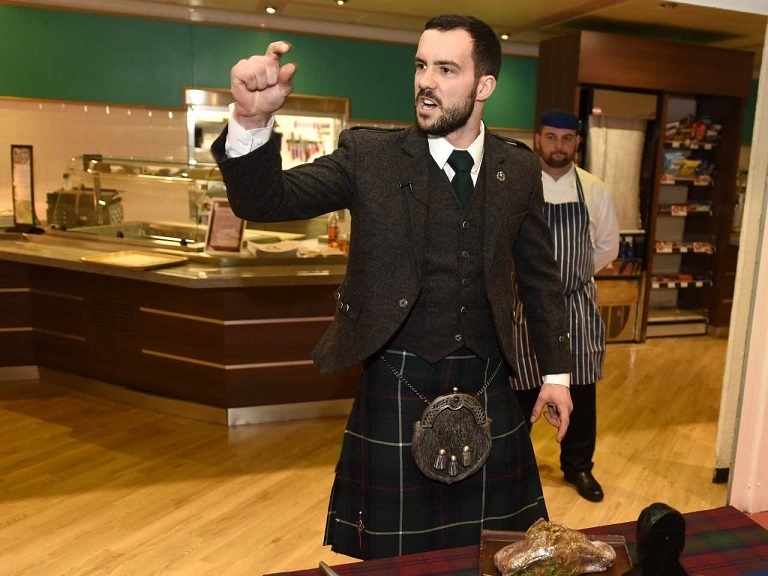 Ben Sherriff, Electrical Maintenance Technician at FEP, offered the Address to the Haggis at the lunch for Cardenden veterans. They were also treated to various Burns’ poems and then a Rabbie Burns singalong. Before their departure back to Cardenden the senior citizens were each presented with a box of chocolates. Spokesman for the group, Alex Burns, MBE, forwarded sincere thanks to Catherine Cubitt and her staff for organising the visit which was enjoyed by everyone who attended. This post was automatically re-published from 3rd party sources without human review. The content may not reflect the views of the Mossmorran Action Group and was reposted due to containing keywords that are of interest to the Action Group. If you feel the content is inappropriate please contact us and we will review the post. jimmy gunn on DEATH TOWN VOW; MSP Nicola’s pledge to fight for truth behind health scare.